The three-person crew will depart the 450-ton research complex at 2244 GMT (6:44 p.m. EDT) Wednesday inside the Soyuz TMA-14M spacecraft, which will unlatch from the space station’s upward-facing Poisk module on the Russian segment of the outpost. Soyuz commander Alexander Samokutyaev will be in the center seat of the Soyuz capsule, flanked on the left by board engineer Elena Serova and on the right by Barry “Butch” Wilmore, the outgoing commander of the space station’s Expedition 42 crew. Samokutyaev and Wilmore are each concluding their second space missions. Serova, the first Russian woman to visit the space station, is on her first spaceflight. After backing a safe distance away from the space station, the Soyuz will fire its thrusters for a four-minute braking burn to drop out of orbit at 0116 GMT Thursday (9:16 p.m. EDT Wednesday). The ship’s propulsion module and austere living quarters — designed to burn up during the fall back to Earth — will be jettisoned at 0142 GMT (9:42 p.m. EDT) before the re-entry capsule encounters the first traces of the atmosphere. The Soyuz TMA-14M landing capsule will plunge through the atmosphere and deploy a series of parachutes to slow its descent to the steppes of Kazakhstan. Moments before touchdown, the ferry craft will fire “soft landing” thrusters to cushion the impact. 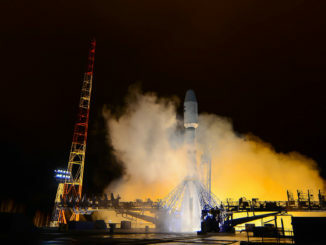 Landing about 90 miles from the town of Dzhezkazgan, Kazakhstan, is scheduled for 0207 GMT Thursday (10:07 p.m. EDT Wednesday), or 8:07 a.m. local time. Wilmore ceremonially transferred command of the space station to NASA astronaut Terry Virts on Tuesday. “Congratulations to all on a job well done,” Wilmore said in remarks addressing the space station’s ground team. “It’s no small task to take the lead and take all the requirements from around the globe and implement them on-board, so our congratulations to you and thanks for making our job really easy. 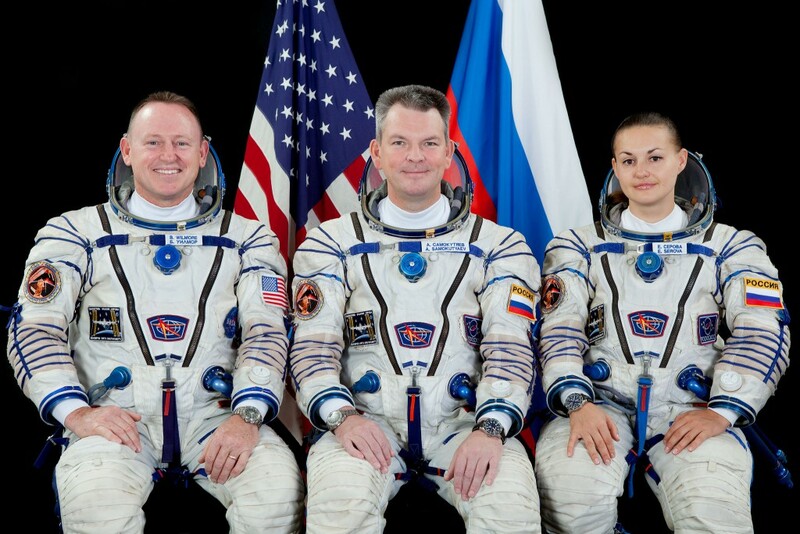 Virts assumes command of the lab’s Expedition 43 crew. He will stay aboard the space station with European Space Agency astronaut Samantha Cristoforetti and Russian cosmonaut Anton Shkaplerov until May 13. Wilmore took over as commander in November and conducted four spacewalks during his mission. Samokutyaev went outside on one spacewalk in October. 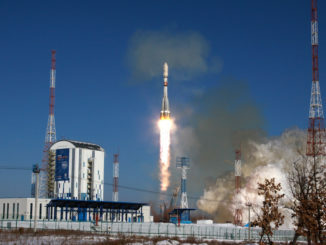 The Expedition 42 increment also saw the arrival Virts, Cristoforetti and Schkaplerov in November, the shipment of fresh supplies and experiments aboard a SpaceX Dragon cargo craft in January, the docking of a Russian Progress supply ship, and the departure of Europe’s final Automated Transfer Vehicle refueling and resupply freighter. “I’ve been so lucky to have the crew that we have,” said Virts, an officer in the U.S. Air Force and a former shuttle pilot like Wilmore. “I just can’t think of having a better group of folks. Kelly, Kornienko and veteran Russian cosmonaut Gennady Padalka are gearing up for launch to the space station March 27. Kelly and Kornienko are due to live aboard the outpost for nearly one year, allowing researchers to monitor how their bodies react to prolonged exposure to weightlessness in advance of planned long-duration missions to Mars.